The rules have changed about what good website security means—starting with a new minimum requirement for all website pages to support encrypted connections. The good news is you’ll gain other valuable benefits by installing https and adhering to this new standard. First, let’s get on the same page by reviewing a few basics. Does Installing HTTPS Really Matter? Enabling encrypted connections is one great reason to protect your website with an SSL Certificate. But, it’s not the only reason. Here are some other ways HTTPS brings value to your business. Being the slow kid on the block and the last one picked for dodgeball is a bummer. Being slow online could cost you everything. HTTP is being replaced by a newer faster version—HTTP/2. Encrypted connections are required to unlock the latest speed and security features. Google includes SSL as a ranking factor. How’d you like to boost your search visibility up to 5%? Be found above the competition by encrypting every page of your website. 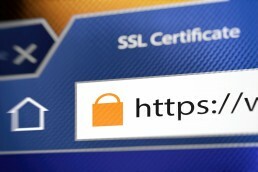 A recent CA Security Council Report shows a mere 2% of customers would proceed past the “Not Secure” warnings that are due to kick in July 1 for all webpages without HTTPS connections. Show visitors your brand values their security by protecting your website with an SSL Certificate. Don’t let visitors engage with several pages on your site only to be get broadsided with a “Not Secure” warning on pages you haven’t protected. They’ll reward you for taking the extra steps to give them an end-to-end encrypted experience. Installing HTTPS is no longer optional if you want to build relationships and a business online. The good news it adds a lot of value to your business. But, SSL Certificates do more than enable HTTPS. They also authenticate, or validate your identity so visitors know it’s really you on the other end of their connection. We’re here to help you find the right level of validation based on your goals.